Are you reading this right now? I mean, really? You're not just staring at the cars on the screen and nodding as you pretend to read? If so, congratulations! This study says people who enjoy fun cars — i.e., me and you — may as well be functionally illiterate. That's what the website Grammarly said in a recent "study" that sought to link people's writing skills to the kinds of cars they drive. 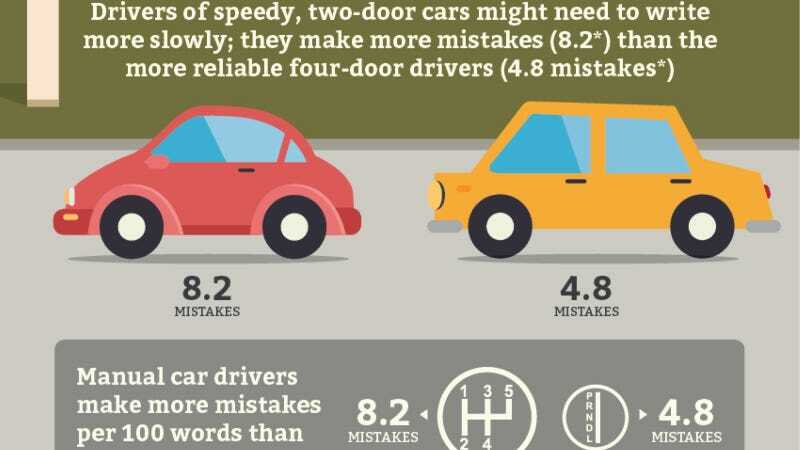 They found that people who drive fast cars with hatchbacks, only two doors, flashy colors (charcoal is a flashy color, apparently) and manual transmissions made far more writing mistakes per 100 words than people with more pedestrian cars. Basically, if you have a Ford Focus ST or a Volkswagen GTI or something, you probably dropped out of middle school. Don't feel ashamed. You're among friends here. Note that I used the word "study" in quotes above. That's because Grammarly's methodology doesn't seem terribly scientific: they examined just 200 used car postings on AutoTrader.com to check for writing errors. That's right. AutoTrader.com listings are now an indicator of how well the rest of us can write. That's kind of terrifying, at least until you think how much worse it could have been if they used Craigslist. There's some real motherfucking doozies out there, let me tell you. Anyway, here's Grammarly's infographic, which is all in good fun. Check it out and let us know what you think in the comments, if you're even able to read or write at all.